The Helambu area, one of the most beautiful regions in the foothills of the Himalaya, is just a few days trek away from the city of Kathmandu, just over the Kathmandu Valley rim. It is situated directly northeast of Kathmandu in the Central Himalayan Region. It is in the Sindupalchowk district of the Langtang National Park. Helambu treks begin from Sundarijal or Melamchi Pul. The people of the Helambu region are often referred to as ‘Sherpas’. However, neither their languages, customs nor clan structure resemble the Solu-Khumbu Sherpas of the Everest region. They are thought to be more akin to the Langtang Bhotias, and may also have originated from the Kyirong area of Tibet just across the border. Their religion and monasteries show their rich Buddhist culture. At lower elevations along the edges of the park, other middle hill tribes and castes reside, including Brahmins, Chhetris, Newars and some Gurungs. Day 01Dhunche to Syabru Besi(2581m) Trek from Dhunche to Syabru Gaon (2581m.) which takes about five and half hours. Trek to Syabru Gaon (6950ft, 2120m). The trek today is very leisurely through forests and terraced hill slopes. As you enter Syabru, you descend to the ridgeline that separates the Langtang Khola from the Trisuli River. Syabru is a beautiful village stretched out along the ridgeline. You will continue through the village to your campsite about fifteen minutes beyond on the slopes below the village. The sunset is spectacular, brilliantly backlighting the houses perched on the ridgeline above. From here you can enjoy spectacular view of Lantang Lirung (7245m. ), Tibetan Himal ranges and so on. 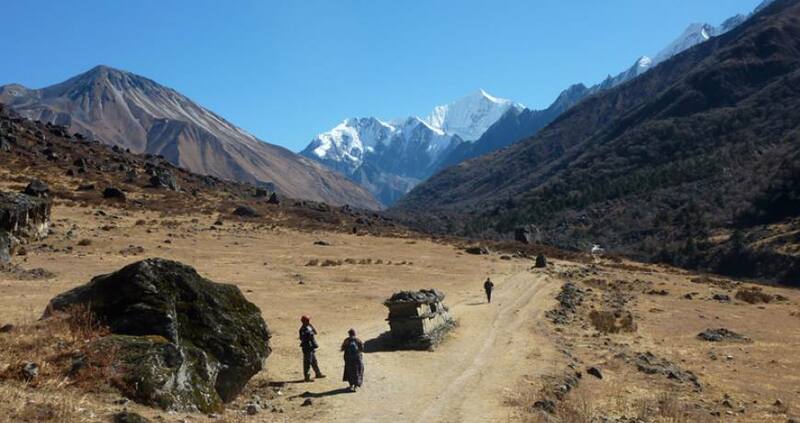 Day 03Lama Hotel To Langtang Village (3430m) Your gentle climb to begin with soon steepens high above the river to Ghora Tabela. (2970m). You will soon find yourself in open country with scattered Tamang settlements. You will have climbed nearly 100m today relatively steadily. The village here is home to some yak herds and cheese factories, worth exploring if you have the energy. Day 04Langtang Village To Kyanjing (3870m) You will climb to the ridge this morning marked with a big chorten and some Mani walls, from here you will have views of Kyanjing Gompa and the icefall from Langtang Lirung surrounded by snowy mountains. You will be walking for around 3 hours today so time to explore the area this afternoon. Day 05Rest Day Rest day at Kyangjin Gompa and excursion in and around. This is day to rest and explore the area. You can visit the monastery and the cheese factory, walk up the moraine to see the spectacular ice faces and tumbling glaciers of Langtang Lirung or ascend Kyangjin Ri [4350m], directly behind the village, for a breath-taking panorama of the Langtang peaks. Day 07Lama Hotel To Thulo Syabru Besi The beginning of your journey today is very pretty and offers magnificent views. You will begin descending gently before it steepens to Syabrubesi, taking about 5 hours in total. Day 08Thulo Syabru to SingGompa or Chandanbari(3330m) Trek from Thulo Syabru to Sing Gompa or Chandan Bari (3330m.) and it takes about five hours. The trail from Thulo Syabru to Foprang Danda (3200m.) follows steeply ascent path passing through Dursagang (2660m.) along with the view of Langtang Himal, Ganesh Himal, Tibetan Mountain and oak, Hemlock, firs forests. Now the path gently ascends for some distance and then follows flat level to Sing Gompa. There is a well managed local cheese factory and a Buddhist Monastery. Day 09Sing Gompa To Gosinkunda(4460m) You start with a climb through rhododendron forests this morning, if you are here during the spring, enjoy the fabulous colours as the trees are in bloom, eventually you will emerge at the saddle of Chalang Pati (3380m), you will soon enter the Gosainkunda protected area, please do respect your surrounding environment and local cultures. There are few places to stop for water today so be sure you have enough on you. You will enjoy great views along the ridge of Langtang Lirung from the north and looking west you can see Ganesh Himal and Manaslu, Tibet is also visible in the distance. Shortly the lakes will come in to view as the climb continues gently, you will then drop to the third lake, the hold Gosainkunda (4380m). Many people come here to worship and bath in the lake during full moon festivals every August. Day 10Gosinkunda to Lauribinayak Pass to Ghopte(4610m) Today is a long one on many rough rails, it will take around 7 hours, to begin with you will follow the north side of the lake before climbing towards the pass of Laurebina La (4610m), on the way you will see more lakes as you go. You will find many cairns on the pass, from here you will begin your descent through some summer pastures to Phedi (3740m) and Dupi Chaur (3630m) and finally to Gopte (3440m).